This summer, role-play as your favorite Sengoku characters in Mark of Honor: Hieizan Temple. 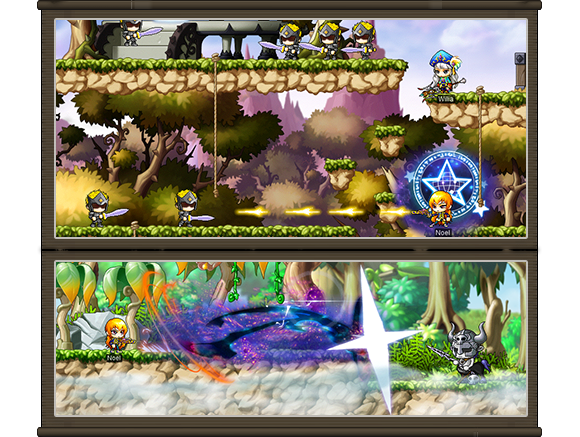 Take on this challenging new dungeon, guarded by the Princess No, as Kanna or Hayato, or their friend and ally Ayame. Once you’ve reigned supreme, try out the new area of Kritias. Plus, try out the revamped Jett class, now with all-new skills and a more detailed backstory! While you’re out bounty-hunting, keep an out for new Wanted posters, and defeat the monsters listed to receive their bounty. But that’s not all! School is back in session at Maple Leaf High and Mr. Schrodinger needs your help! 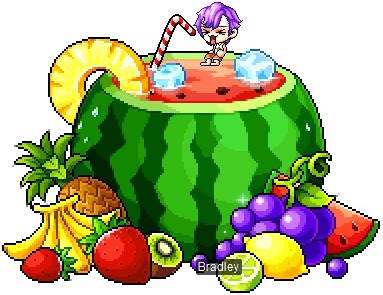 Read on for all the details on MapleStory’s newest update. 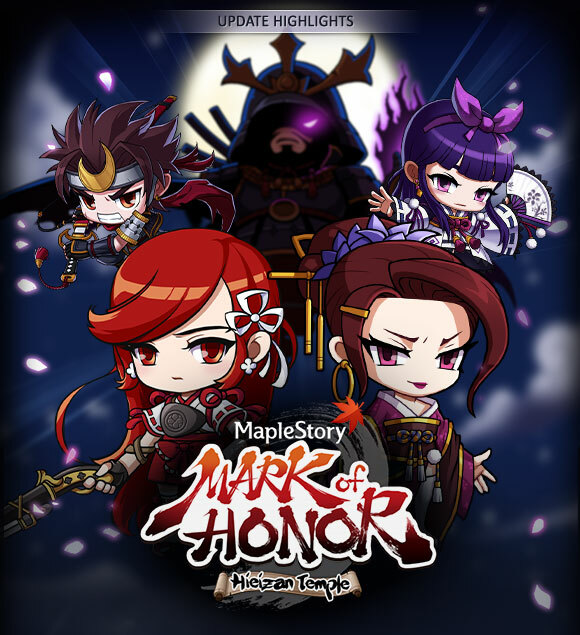 Go back in time and play as Kanna, Hayato, or their friend Ayame in the days before they travelled to Maple World. Try out these heroes’ special skills, and explore the new Hieizan Temple. Then, embark upon the Princess No Expedition to receive a special Jewel Box containing Lv. 140 secondary weapon equips and other rewards, such as a Princess No Chair. Check out the new high-level area of Kritias! A mysterious kingdom has appeared near Leafre…what could lay inside? Hunt Commanders and Minion Monsters to earn Kritias Points and Kritias Coins, then trade them in for Lv. 150 earrings, shoulders, and glove equips. You can also complete daily quests and take part in Invasion Events. New damage skins, chairs and mounts are just some of the rewards waiting for you in Kritias. Jett is getting an upgrade, with a completely revamped set of skills. With Backup Beatdown, you can launch a flurry of attacks with your bounty hunter allies, while Starforce Salvo will fire a repeated hail of energy bolts. Jett is also getting a new secondary weapon and an increase to HP! With an expanded intro, you’ll get a deeper insight into the backstory of MapleStory’s favorite bounty hunter. Class is in session, and Mr. Schrodinger needs his students’ full attention! Fight your way through classrooms, completing quests along the way. Break desks and other furniture to rescue lost friends and collect recyclables. Gotta keep that school green! Collect Model Student Candy and exchange it for brand-new totems and pocket items. It’s monster hunting time! 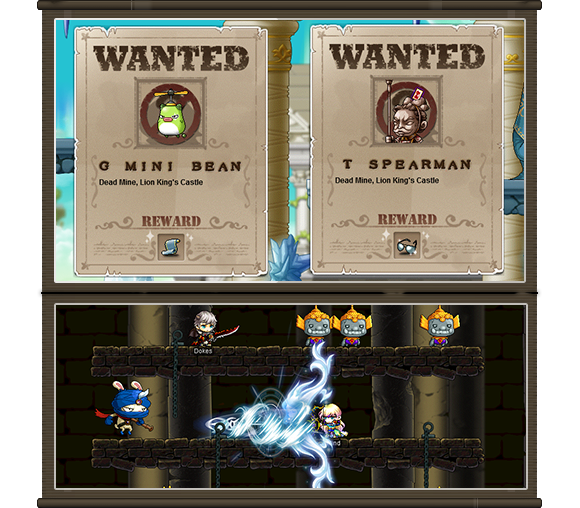 During the Bounty Hunter Event, you’ll find Wanted posters for infamous monsters all over Maple World. Collect their bounties and you could receive sunglasses, rings, necklaces and earrings, plus special medals and badges. Want a break from bounty hunting? Collect Pearlescent Clamshells from monsters in the Clam Shell Attendance Check Event to earn various scrolls, plus a Character Slot Expansion Coupon! V.152 – Mark of Honor: Hieizan Temple is live on August 13! Take part in a special roleplay dungeon where you can become a character from the past! Become either Kanna, Hayato, or Ayame and journey into the Sengoku Era to participate in a new theme dungeon! Accept the quest ‘Regards, Takeda Shingen’ from the quest notifer on the left side of the game window. Go to Momijigaoka and speak to Takeda Shingen to learn about the new warrior who has appeared there. The new warrior is Ayame, who went missing long ago. She had been sent to spy on Princess No, her previous master; and earn her trust. Princess No sent her off on missions. While she was gone, the Nobukane family was destroyed by Oda Nobunaga, and he also kidnapped Princess Sakuno. Oda Nobunaga wanted to sacrifice Princess Sakuno in Honnou-ji in an attempt to become a new Demon King. Princess No was the wife of Oda Nobunaga. Hayato appeared to defeat Nobunaga and was stopped by Princess No. Ayame came to his aid, shooting at Princess No and disarming her. After that, Ayame was transported to Maple World. She followed Oda soldiers and ended up near Momijigaoka. She recognized the location as Hieizan–a place she was raised when she first served under Princess No. She relays this info to you and Princess Sakuno, and wants to go investigate Hieizan. 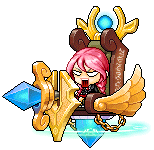 But Princess No put a spell on Hieizan, blocking anyone from Maple World from entering it. However, there is a potion that will get you past. 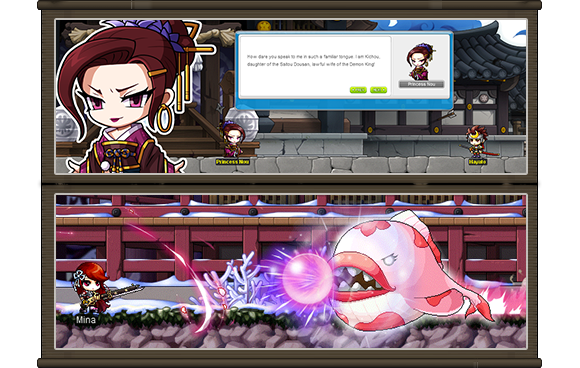 Use the potion to turn into Hayato, Kanna, or Ayame–before they came to Maple World. You will only have access to the skills of these characters from before they arrived in Maple World. Even if you are currently Kanna or Hayato, you will have different skills–as Hayato and Kanna were different before they came to Maple World. When you drink the potion, you can select which character you want to become. Once chosen, you must complete the investigation of Hieizan as that character. You can’t change characters until you are finished with the investigation. Once you select the character you want to be, you will become them! You will not be able to use your original skills, and will only be able to use the skills of the character you are roleplaying. Any skills assigned to hotkeys will be reset. Any skills assigned to hotkeys will be restored after leaving the roleplay dungeon. During the roleplay dungeon, you can assign the skills of the character you are roleplaying to hotkeys. If you later become this character again and re-enter the dungeon, the skills will be assigned to the same hotkeys you picked the first time. Start the quest “Investigating Hieizan” to enter Hieizan Temple. Progress deep into the temple and defeat Princess No to recover the Matsuyama Family Mirror, the holy artifact of the Matsuyama family. Military Might – Master Level 20. Temporarily increases Max HP, Max MP, Weapon ATT, Speed, and Jump. Merciless Blade – Master Level 10. Your attacks leave unhealing bleeding wounds, dealing HP damage over time. Bleeding doesn’t stack and can’t cause the target’s HP to go below 1. Whirlwind Cut – Master Level 20. The third Battoujutsu secret technique. Transform into a whirlwind of death as you rush forward. Send enemies flying into the air if you use it right after Shouryuusen. Tornado Blade – Master Level 20. Turns your blade into a tornado of steel, pushing all enemies around you to one side. Rai Sanrenzan – Master Level 30. Deal three devastating slashes against up to 6 enemies. Has a chance to deal extra damage. Shinsoku – Master Level 30. Focuses your fury and skill to attack a single enemy. Hitokiri Strike – Master Level 30. The ultimate in destructive blows. Attacks multiple enemies with a guaranteed critical. Can instant KO enemies, and Hayato’s Critical Rate increases for a short period after use. Shouryuusen – Master Level 15. Hurls a mighty whirlwind forward to toss enemies into the sky. Chapter one of the Battoujutsu technique. Ice Dragon Strike – Master Level 20. Energy of the Ice Dragon attacks nearby enemies and pulls them towards Hayato while again. Ether Pulse – Master Level 15. Hold down the skill key, then use the arrow keys to teleport. Any enemies between your start and end path will be damaged with a chance to stun. Teleport to a random spot by tapping the skill key twice. Spirit Corral – Master Level 20. Borrows the power of the fox spirit to gather enemies in one spot. Soul Shear – Master Level 15. Shear a piece of your target’s soul off with each attack. Use the skill again to detonate any fallen soul fragments. Can be stacked up to 10 times on normal monsters and 15 times on boss monsters. Vanquisher’s Charm – Master Level 30. Blasts the enemy with evil-destroying charms. Hold down the skill key for a rapid-fire attack. Orochi – Master Level 30. Summons the mighty Orochi to attack up to 15 enemies. Falling Sakura – Master Level 20. 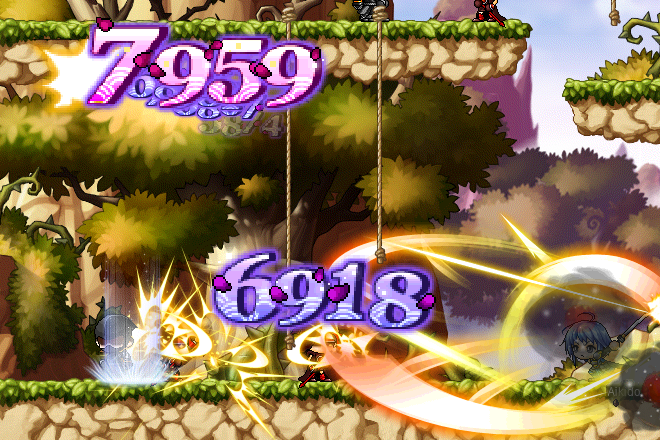 Summons a sakura tree that damages nearby enemies while healing party members. Bellflower Barrier – Master Level 20. Summons a magical barrier to strengthen you and party members against boss monsters. Foxfire – Master Level 20. Haku summons several foxfires. Each foxfire can be used to nullify an enemy spell or reflect damage back. Haku – Master Level 1. Haku, the loveable spirit fox, will follow you to the ends of the universe. The only thing Haku loves more than Kanna is Star Candy, and just by a tiny bit. Blossom Barrier – Master Level 10. Summons a powerful cherry blossom barrier to protect you and your party members. Haku Reborn – Master Level 10. Haku takes human form to fight by Kanna’s side. Tengu Strike – Master Level 20. Summons Tengu to attack enemies on either side of you. Shikigami Haunting – Master Level 20. Calls forth a terrifying ghost to attack enemies in front of you. Does not consume Mana. Mighty Shikigami Haunting – Master Level 15. Channels the power of Take-mikazuchi, god of lightning, into Shikigami Haunting, adding extra damage and knockback. Frozen Advent – Master Level 20. Summons the god of ice to obliterate your foes. Gunpowder Blossom – Link – Master Level 30. A repeatable skill. Swing your gun like a sword, followed by 3 shots. The shots explode, damaging nearby enemies and knocking back the target. Gunpowder Blossom – Penetration – Master Level 30. Focus your aura to give your shots the power to penetrate targets. Gunpowder Blossom – Ultimate Range – Master Level 30. An ultra-long-range marksmanship technique used to snipe at Princess No. The shot is fired with maximum force for incredible range and damage. Gunpowder Blossom – Ice – Master Level 30. An aura that removes all heat from your shot. Damages and freezes enemies when hit. Gunpowder Blossom – Fly – Master Level 30. Permanently increases Speed, Max Movement Speed, and Jump. Allows you to jump again in midair. Vengeful – Level 1. Your lust for revenge increases your party’s Weapon ATT and Magic ATT for a short time. Iron Flower Gun – Mysterious Burst – Master Level 30. Grants an explosive aura that makes every shot more powerful. You cannot move while this stance is active. Requirement: Party of 2-6 players Lv. 140 or above. All party members must have completed “Investigating Hieizan” and “The Five Star’s Message”. Face the true power of Princess No and defeat her to receive various unique rewards! Go to the Dimensional Mirror in major towns, and select “Princess No Expedition” to be teleported to Hieizan Temple Plaza. The party leader has to possess the Hieizan Temple Key (dropped by Princess No in the roleplay dungeon Hieizan Temple). Speak with Ayame at the entrance to start the expedition. The dungeon comprises a total of 5 stages. 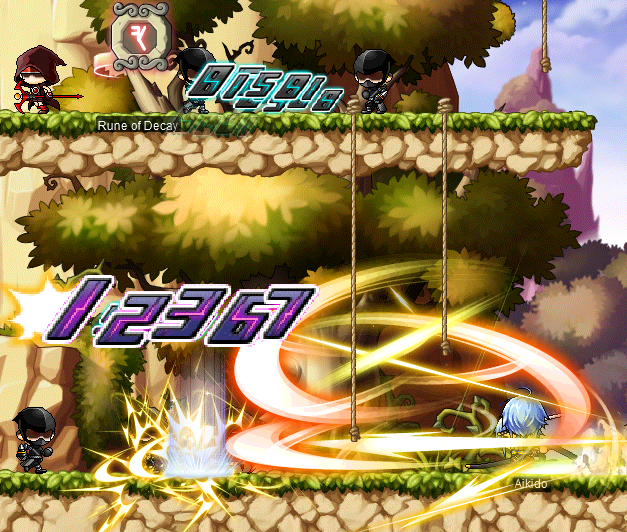 Players need to defeat the boss of each stage to move onto the next via the portal. Once the party defeats Princess No at the final stage, you will be moved to a personal reward map. Talk to the NPC in the map to receive Princess No’s Jewel Box, which will randomly give one of the items listed below. Princess No’s Jewel Box is available in 3 levels, depending on the total number of times you’ve cleared the dungeon. Clear One Time – Princess No’s Copper Jewel Box: Rewards Normal or Rare items. Clear Two Times – Princess No’s Silver Jewel Box: Rewards Normal or Rare items, with a very small chance to reward Unique items. Clear Three Times – Princess No’s Gold Jewel Box: Rewards Rare items, with a small chance to reward Unique items. Normal rewards include restorative items and Spell Traces. Rare rewards include Princess No Chair (Untradeable), the Princess No Effect Coupon (Untradeable, double-click to toggle on or off. This item can be disposed of in the Clothes Collector in Henesys Market), Cubic Blades (normal and Chaos), larger bundles of restorative items and Spell Traces. New Lv. 140 secondary weapons have been added to the game. You have a chance to obtain them from Princess No’s Gold Jewel Box. Kaiser, Angelic Buster, Mechanic, Demon Slayer, Demon Avenger, and Mihile will receive a coupon that will upgrade their current secondary weapon to the new secondary weapon. Secondary weapons upgraded with the coupon will have all Potentials, Bonus Potentials, scrolls, enhancements, and Nebulites removed. All new secondary weapons will start with rare Potentials, including secondary weapons upgraded with the coupon. A mysterious kingdom has suddenly appeared near Leafre, shrouded in a thundering blanket of think cloud. Nothing can be seen from the outside, except for the sinister outline of a castle, floating upside down in the sky. Concerned that the unheard-of kingdom might be linked to Black Mage, Neinhart is now seeking brave adventurers across the Maple World to explore this unknown land. 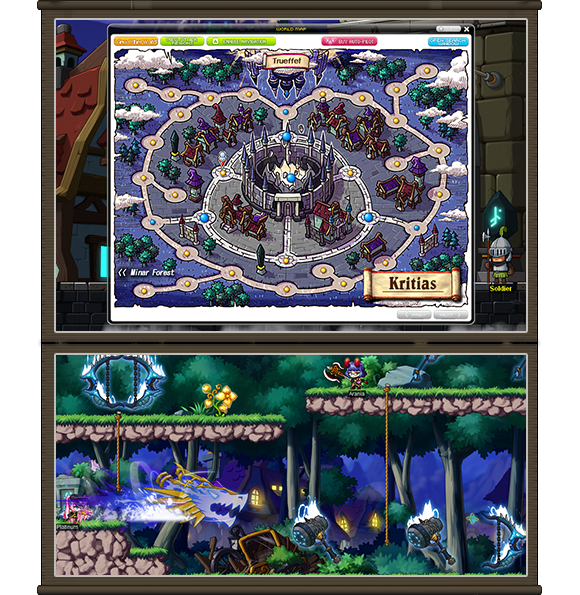 The latest addition to MapleStory’s vast adventure, Kritias arrives with a whole new storyline, repeatable daily quests, a “Commander Invasion” mini game, as well as the Kritias Coin Shop that sells Lv. 150 earrings, shoulders and Tyrant Gloves. Players who are Lv. 160 or above can start the Kritias quest line by accepting the quest “Sudden Kingdom” from the quest notifier on the left side of the screen. The quest can also be accepted by talking to Neinheart in Ereve. After the conversation, you will be teleported to the outskirts of Kritias. The main town will be accessible after the first few quests are completed. You can walk to Kritias by going to Sky Nest I and entering the gates to Kritias. There are various repeatable daily quests that help the soldiers of Kritias to protect the town and its people. You can unlock the daily quests by completing the main quest line for Kritias. Once unlocked, daily quests will be available via the quest notifier on the left side of the screen. Daily quests have a total of 5 stages. Each stage has its own completion requirement that changes on a daily basis. You will be rewarded Anti-Magic or Anti-Magic Stones for clearing the different stages. You can only complete each stage once a day. Daily quests will reset at midnight every day. Prevent the invasion of the Black Mage’s commanders and get rewards of Anti-Magic and Anti-Magic Stones. Commander Invasion can be unlocked by completing the main quest line for Kritias. Once unlocked, a message bar will appear on the top of the screen at every 2 hours between 8 AM and 10 PM Pacific. The timer begins at 35 minutes. At the 30 minute mark, the Invasion will begin and players who have completed the main quest line for Kritias will be transported to the battlefields of Kritias. To successfully prevent Invasion, you must reduce the “Commanders HP Bar” on the top of the screen before the timer counts down to 0. You must complete quests given to you by Blundell at the Northern Barracks to reduce the HP Bar. Anti-Magic and Anti-Magic Stones will be rewarded based on the contribution points players have earned. Both items can be exchanged for Kritias Commemorative Coins and Anheim Coins with NPC Levian in front of Ranheim Academy. Anti-Magic is charged into an Anti-Magic Container (obtained from Kritias quest line or from Kritias Coin Shop for 5,000 Mesos) upon receiving, and can be spent to upgrade Inverse Codex (purchased from Krtias Coin Shop). Talk to NPC Levian and choose to charge anti-magic into your inverse codex. (The Inverse Codex must be equipped to upgrade). In addition to quest rewards, Anti-Magic can also be obtained from monster drops in Kritias. Inverse Metal Shoulder: Lv. 150 Shoulder, All Classes, All Stats +10, ATT/M.ATT +10, DEF/M.DEF +180, Upgrades: 1. Untradeable. Battle Flying Chair Mount Coupon: Allows you to use the Battle Flying Chair Mount for 10 days. Tyrant Hyades Gloves: Lv. 150 Glove, Warrior, STR +12, DEX +12, Max HP +300, ATT +15, DEF +160, Accuracy +35, Upgrades: 2. Untradeable. Tyrant Hermes Gloves: Lv. 150 Glove, Magician, INT +12, LUK +12, Max HP +300, M.ATT +15, M.DEF +160, Accuracy +35, Upgrades: 2. Untradeable. Tyrant Charon Gloves: Lv. 150 Glove, Bowman, STR +12, DEX +12, Max HP +300, ATT +15, DEF +80, M.DEF +80, Accuracy +35, Upgrades: 2. Untradeable. Tyrant Lycaon Gloves: Lv. 150 Glove, Thief, DEX +12, LUK +12, Max HP +300, ATT +15, DEF +60, M.DEF +100, Avoidability +35, Upgrades: 2. Untradeable. Tyrant Altair Gloves: Lv. 150 Glove, Pirate, STR +12, DEX +12, Max HP +300, ATT +15, DEF +100, M.DEF +60, Accuracy +35, Upgrades: 2. Untradeable. Magnus Metamorph Potion: Transforms you into Magnus for 10 minutes. Kritias Damage Skin: Kritias-themed damage skin. Cannot be used by Zero class. Jett has a new intro. Jett and Burke grew up together on the planet Cerberus after Jett’s family took in Burke, whose family had been killed by pirates. Although Jett comes from a family of famous bounty hunters, she wants to be a member of the Royal Guard, helping to protect the king. Unfortunately, Jett can’t pass the tests to become a member of the Royal Guard. Instead she decides to join up with her old friend Burke, who himself is a bounty hunter now. While Burke is captain of a group of bounty hunters, he can never be as good as Jett. Jett’s strength comes from the Core, an heirloom that gives her power. Burke can never have the Core, and this knowledge begins to fester and grow into a deep jealousy of Jett. One day Burke is contacted by a mysterious voice. It wants him to frame Jett–forcing her to go on the run–and bring the Core to Maple World. In return, it will make Burke a powerful bounty hunter. Burke disguises himself as Jett and assassinates the king. Now there’s a bounty on Jett’s head and she has to escape before the Royal Guard catches her. Together, Jett and Burke escape and end up in Maple World. 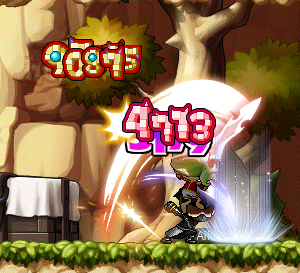 Jett’s HP has increased. Whenever Jett levels up, takes a job advancement, or has AP assigned to HP, the max HP will increase more than before. Existing secondary weapons (Core Controller items) have been removed and replaced with a new secondary weapon (Fist items). Existing Potentials and Nebulites will carry over to the new secondary weapon. The Lv. 30, 60 and 100 Job Advancement quests that gave out Core Controller equips no longer give out the items. You can buy Secondary Weapons from Secondary Weapon merchant Neville. There are Secondary Weapons for Lv. 10, 30, 60, and 100 from Neville. Jett now has new original skills. All SP will be reset. [NEW] Return to Spaceship: Move to Jett’s spaceship. [NEW] Starline One: Use the attack key to deal 3 quick hits to nearby enemies. Continue pressing the attack key after these hits to follow up with additional devastating moves. They can also be used individually. [NEW] Blaster Barrage: Fires a pair of shots straight ahead. Hold down the skill key for continuous fire. You can move left and right while attacking. [NEW] Space Walk: Use the arrow keys to tumble while jumping. Press jump and the arrow key again to tumble once more in the selected direction. [NEW] Vortex Jump: Focuses your power on warping forward and smashing your target. If no enemies are ahead, you’ll simply teleport forward. You can use this skill without delay when using it with another skill. [NEW] Seasoned Hunter: Become proficient in the bounty hunting fundamentals. Increases Accuracy, Avoidability, Movement Speed, and Max Movement Speed. [NEW] Galactic Might: Increases the body’s reflexes by drawing on cosmic powers. [NEW] Starline Two: Unleash beams of energy on multiple enemies. Has a chance to stun enemies. Continue pressing the attack key after these hits to follow up with additional devastating moves. They can also be used individually. [NEW] Stellar Impact: Smashes a spacecraft into the ground, creating devastating shockwaves. The shockwaves penetrate multiple enemies and launch them into the air. [NEW] Vortex Cross: Strike enemies as you warp past them. You will move upwards if used while pressing the Up arrow key. [NEW] Bounty Chaser: Pulls out all the stops to help you take down your target. Enhances your physical strength and increases your Attack Power. [NEW] Volt Barrage: Strengthens Blaster Barrage by absorbing the powers of nature. [NEW] Cosmic Shield: Permanently enhances STR, DEX and HP through physical training. Has a chance to activate additional Power Stance effects. [NEW] Starline Three: Force your way through multiple enemies to blast them. Continue pressing the attack key after these hits to follow up with additional devastating moves. They can also be used individually. [NEW] Falling Stars: Leap into the air and blast multiple enemies below you. Hold the key down to keep attacking. [NEW] Cosmic Upheaval: Explode the ground beneath nearby enemies and draw them in. [NEW] Slipstream Suit: Changes the flow of cosmic energies to increase swiftness and accuracy. [NEW] Spacial Shift: Enhances Vortex Cross. Can move forward/upward/downward depending on the key. [NEW] Blaster Overdrive: Removes all safeties from your weapons, granting them ridiculous Critical Rate and Weapon ATT bonuses. [NEW] Clairvoyant: Enhances vision to permanently determine weaknesses, and grants the ability to predict attacks. [NEW] Starline Four: Attack multiple enemies while forcing your way through the crowd. [NEW] Starforce Salvo: Fires a hail of energy bolts. Hold down the skill key to keep shooting. You can move left and right while attacking. [NEW] Backup Beatdown: Launches a flurry of attacks with your bounty hunter allies. This attack can be used while moving. [NEW] Planet Buster: Concentrates enough force to crack a planet, then surges forward and unleashes it on your enemies. [NEW] High Gravity: Increases your mass, preventing you from being knocked back and increasing Attack Power and Boss ATT greatly. [NEW] Strikeforce Showdown: Summons armored allies to blast your foes to pieces. Chance to activate during Starforce Salvo. [NEW] Giga Blaster: Upgrades your arsenal to the biggest, baddest blasters in the universe. Increases the min and max damage of your critical hits. [NEW] Invincibility: Enhances the body to permanently enhance all contents required for defense. Significantly enhances internal strength to increase Attack Power. [NEW] Backup Beatdown – Reinforce: Increases Backup Beatdown’s damage. [NEW] Backup Beatdown – Spread: Increases the number of enemies hit when you use Backup Beatdown. [NEW] Backup Beatdown – Extra Strike: Increases the number of attacks that Backup Beatdown deals. [NEW] Planet Buster – Critical Chance: Increases Planet Buster’s Critical Rate. [NEW] Planet Buster – Guardbreak: Ignores the monster’s Defense when using Planet Buster. [NEW] Planet Buster – Extra Strike: Increases Planet Buster’s attack count. [NEW] Starforce Salvo – Reinforce: Increases Starforce Salvo’s damage. [NEW] Starforce Salvo – Range: Increases Starforce Salvo’s attack range. [NEW] Starforce Salvo – Boss Rush: Increases Starforce Salvo’s Boss Attack. [NEW] Singularity Shock: Focus the Core’s power into a single point of pure destruction, which explodes and knocks enemies back. Accept the quest ‘[Skill] Return to Spaceship’ from the lightbulb quest notifier on the left side of the game window. You will be transported to the Spaceship Cockpit, where you can speak to Kelm to complete the quest. [NEW] Return to Spaceship: Master Level: 1. Move to Jett’s spaceship. Cooldown: 10 minutes. From the Spaceship Cockpit map, you can move to most town maps once every hour. Drops from Mori Ranmaru have been updated. Normal mode Mori Ranmaru will drop Lv.150 Japanese Myth set equipment and weapons at a very low chance. Hard mode Mori Ranmaru will drop Lv.150 Japanese Myth weapons at a low chance. Both normal and hard mode Mori Ranmaru will have a slightly increased chance to drop Japanese Myth recipes and crafting items. Some small additions have been made to Mori Ranmaru’s drops to be more in line with most bosses, including various restorative and crafting items. Due to the addition of the Scroll Trace system, Hard Mori Ranmaru will no longer drop these low-stat scrolls: Scroll for Katana for ATT, Scroll for Fan for Magic ATT. You will now be able to preview REG style coupons for Hair and Face in several of the Hair Style and Plastic Surgery Shops. Just click on an NPC that offers REG styles and you will see the option to preview the styles. The tradeability of the Lv.150 Japanese Myth items has been updated. Recipes, crafting ingredients, and the Amaterasu Lucky Item Scroll have been changed from untradeable to tradeable. Equipment has been changed to tradeable until it is equipped. Platinum Scissors of Karma will be needed for each trade after it has been equipped. Items that were equipped before the update will be marked as tradeable until equipped until they are equipped again. The reward has been removed from the quest ‘[Education] Using the Megaphone’ due to many player concerns over time regarding megaphone spam. The reward has been removed from the quest ‘[Education] Using Magnifying Glass’ due to the switch from the Magnifying Glass item system to the Appraisal system. The quests ‘[Education] About Fight For Azwan’ and ‘[Education] Eliminating Balrog’ have been removed due to changes in this content in v150. Javert, the Commerci Denaro vendor, will now restock his items daily. Gender restrictions have been removed for trading cash cover equipment. Accept the quest ‘[Sengoku Era] The Hieizan Temple Experience’ from the event notifier on the left side of the game window. Complete the ‘Investigating Hieizan’ quests with Hayato, Kanna, and Ayame to complete the event. Accept the quest ‘[Sengoku Era] Stop Princess No!’ from the event notifier on the left side of the game window. Defeat Princess No in the Princess No Expedition to receive a special Princess No Damage Skin (Expires after 30 days if it isn’t used, untradeable). Defeat Princess No 10 times to receive a permanent Princess No Damage Skin (permanent, untradable, this item is not consumed when used and can be recycled). [Update] Due to a critical bug with Maple Leaf High, the maps have been closed. You will still be able to do the quest to receive your free key, but you will not be able to enter the Maple Leaf High maps. Please be aware that due to the key’s 24 hour duration, we advise not doing the quest to get the key too early as your key may expire before getting a chance to use it. This is planned to be fixed in an upcoming minor patch. Get ready to go to school at Maple Leaf High! Red Leaf High has been updated with new characters, a new boss, and new rewards. Players may enter the school by speaking with Schrodinger, located in most major towns. Each day of the event, players Lv. 13 or above may receive one free Maple Leaf High Regular Class Key by speaking to Schrodinger, accepting the quest ‘The New Kid’, and defeating 300 monsters in their level range. Some monsters do not apply. Additionally, players may also purchase Maple Leaf High Special Class Keys from the Cash Shop. Once inside the school, fight your way through the classrooms until you challenge Captain Finger. Collect Model Student Candy from Schrodinger when you defeat a classroom, which can be used to purchase items from the Model Student Locker or the Four Pillars of Heaven. Complete daily quests from the students and earn EXP and Model Student Candy. Complete Mr. Schrodinger’s Special Assignments to earn EXP and Model Student Candy. Break open desks and other furniture placed in various places of the classroom and find the hiding lonely friends. Bring lonely friends back to Mr. Schrodinger to earn a Model Student Candy for every three friends returned. Break open desks and other furniture placed in various places of the classroom and find the recyclables. Place 50 of them in the correct recycling container and return to Schrodinger to receive 50 Model Student Candies. 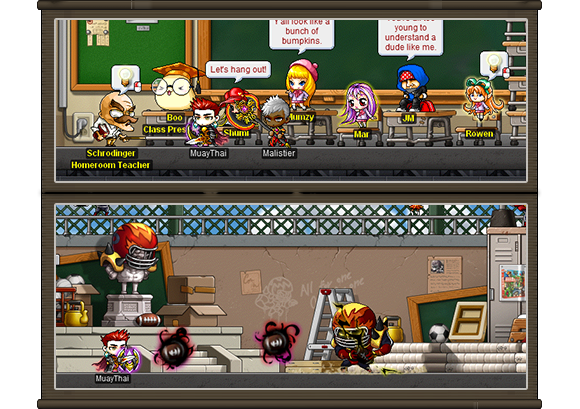 These items can be purchased with Model Student Candies, which are earned by completing each stage in Maple Leaf High. You can also still get the classic totems from the Four Pillars of Heaven. Monsters also have a chance to drop Lv. 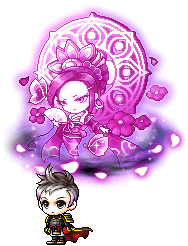 99 Grand Maple Amethysian weapons and Lv. 79 Maple Amethysian weapons. Obtain a gift box when you reach each of the following levels as Jett (Lv. 30, 50, 70, 90, and 110). Accept the reward by clicking the ‘[Jett] Lift Off’ quest through the event notifer on the left side of the game window. Make sure to open the boxes before 9/16/14 23:59. Explorer’s Brace Look – Req. Lv. 30, STR +3, DEX +3, Weapon Defense +40, Magic Defense +18, Number of upgrades available: 10, Unhammered, Durability: 100%, Untradeable. Epic, One of a kind item. Has Potential. Explorer’s Lunar Shooter – Req. Lv. 30, DEX +5, Weapon Attack +40, Avoidability +30, Attack Speed: Fast, Number of upgrades available: 7, Unhammered, Durability: 100%, Untradeable. Epic, One of a kind item. Has Potential. 1.5x EXP Coupon – Untradeable, 7 day duration. Buff lasts for 1 hour. Ion Suit – (Male or Female given based on character’s gender.) Req. Lv. 60, STR +4, DEX +4, LUK +4, Weapon Defense +60, Magic Defense +60, Number of upgrades available: 7, Unhammered. Untradeable. Epic item. Has Potential. Ion Boots – Req. Lv. 60, STR +1, DEX +1, LUK +1, Weapon Defense +15, Magic Defense +15, Speed +1, Jump +1, Number of upgrades available: 5, Unhammered. Untradeable. Epic item. Has Potential. Jett’s Special Hat – Req. Lv. 50, STR +10, DEX +10, INT +10, LUK +10, MaxHP/MaxMP +100, Weapon Defense +90, Magic Defense +90, Number of upgrades available: 10, Unhammered. Untradeable. Epic item. Has Potential. When your Jett is at 3rd job or 4th job, receive an additional: STR +5, DEX +5, INT +5, LUK +5, Weapon Attack +5, Accuracy +100. Critical Adventure Ring – Req. Lv. 70, MaxHP/MaxMP +200, Weapon Attack +3, Magic Attack +3, Untradeable. One of a kind item. Union Shooter – Req. Lv. 75, Weapon Attack +70, Attack Speed: Fast, Number of upgrades available: 7, Unhammered, Untradeable. Epic item. Has Potential. Chaos Peacemaker – Req. Lv. 95, Weapon Attack +82, Attack Speed: Fast, Number of upgrades available: 8, Unhammered, Untradeable. Epic item. Has Potential. Royal Adventure Suit – Req. Lv. 80, STR +10, DEX +10, INT +10, LUK +10, MaxHP +100, Weapon Attack +1, Weapon Defense +155, Magic Defense +155, Number of upgrades available: 10, Unhammered, Can be moved within an account one time (untradeable after being moved). Epic item. Has Potential. Gaussfield Mark 5 – Req. Lv. 120, Weapon Attack +82, Attack Speed: Fast, Number of upgrades available: 8, Unhammered, Untradeable. Epic item. Has Potential. Can be traded one time with Platinum Scissors of Karma. Click the Attendance Check notifier on the left side of the game window to accept the event. Hunt monsters within your level range and collect 30 Pearlescent Clamshells that they drop. Some monsters do not apply. Once you’ve collected the items for that day, you can receive a stamp in your Attendance Log. Attendance can be counted once a day per world. You can check your attendance status by clicking the Attendance Check notifier on the left side of the game window. 1 Day – Accessory Scroll Exchange Ticket: 1 day duration, Untradeable. Use to receive an Accessory Enchantment Scroll 60% – 10 day duration, Untradeable. Defeat monsters until the “Wanted Monster’s Clue” item is dropped. Once acquired, the quest “Capture the Wanted Monster” will start automatically. Click on the “Wanted Monster” notifier that appears above your character’s head to view the wanted poster. Hunt for more monsters to receive additional “Wanted Monster’s Clue” items that will give hints to the whereabouts of the “Wanted Monster”. You can obtain up to 3 clues per monster. After locating and hunting the “Wanted Monster,” the quest will automatically complete and you will be rewarded with a Bounty Hunter Special Item Box and scroll or a piece of Bounty equipment. Hunting all the “Wanted Monsters” within a specific level range (Lv. 30 – 60, Lv. 61 – 90, Lv. 91 – 120, Lv. 121 – 150, Lv. 151 – 250) will reward you with a Medal and Badge. Even if you don’t get all the clues, you just have to hunt the designated monsters and you can complete the quest and receive the rewards. Bounty Rookie’s Sunglasses: REQ Lv. 30, STR/DEX/INT/LUK +1, Max HP/MP +10, Number of upgrades available: 1, Untradeable. Bounty Hunter’s Sunglasses: REQ Lv. 60, STR/DEX/INT/LUK +2, Max HP/MP +50, Number of upgrades available: 2, Untradeable. Bounty Veteran’s Sunglasses: REQ Lv. 90, STR/DEX/INT/LUK +3, Max HP/MP +100, Number of upgrades available: 2, Untradeable. Bounty Master’s Sunglasses: REQ Lv. 135, STR/DEX/INT/LUK +4, Max HP/MP +200, Number of upgrades available: 3, Untradeable. Bounty Legend’s Sunglasses: REQ Lv. 150, STR/DEX/INT/LUK +5, Max HP/MP +300, Number of upgrades available: 3, Untradeable. Bounty Rookie’s Earrings: REQ Lv. 30, STR/DEX/INT/LUK +1, Max HP/MP +10, Number of upgrades available: 1, Untradeable. Bounty Hunter’s Earrings: REQ Lv. 60, STR/DEX/INT/LUK +2, Max HP/MP +50, Number of upgrades available: 2, Untradeable. Bounty Veteran’s Earrings: REQ Lv. 90, STR/DEX/INT/LUK +3, Max HP/MP +100, Number of upgrades available: 2, Untradeable. Bounty Master’s Earrings: REQ Lv. 135, STR/DEX/INT/LUK +4, Max HP/MP +200, Number of upgrades available: 3, Untradeable. Bounty Legend’s Earrings: REQ Lv. 150, STR/DEX/INT/LUK +5, Max HP/MP +300, Number of upgrades available: 3, Untradeable. Bounty Rookie’s Necklace: REQ Lv. 30, STR/DEX/INT/LUK +2, Max HP/MP +10, Number of upgrades available: 1, Untradeable. Bounty Hunter’s Necklace: REQ Lv. 60, STR/DEX/INT/LUK +3, Max HP/MP +50, Number of upgrades available: 2, Untradeable. Bounty Veteran’s Necklace: REQ Lv. 90, STR/DEX/INT/LUK +4, Max HP/MP +100, Number of upgrades available: 2, Untradeable. Bounty Master’s Necklace: REQ Lv. 135, STR/DEX/INT/LUK +5, Max HP/MP +200, Number of upgrades available: 3, Untradeable. Bounty Legend’s Necklace: REQ Lv. 150, STR/DEX/INT/LUK +6, Max HP/MP +350, Number of upgrades available: 3, Untradeable. Bounty Rookie’s Ring: REQ Lv. 30, STR/DEX/INT/LUK +1, Max HP/MP +10, Number of upgrades available: 1, Untradeable. Bounty Hunter’s Ring: REQ Lv. 60, STR/DEX/INT/LUK +2, Max HP/MP +50, Number of upgrades available: 2, Untradeable. Bounty Veteran’s Ring: REQ Lv. 90, STR/DEX/INT/LUK +3, Max HP/MP +100, Number of upgrades available: 2, Untradeable. Bounty Master’s Ring: REQ Lv. 135, STR/DEX/INT/LUK +4, Max HP/MP +300, Number of upgrades available: 3, Untradeable. Bounty Legend’s Ring: REQ Lv. 150, STR/DEX/INT/LUK +5, Max HP/MP +400, Number of upgrades available: 3, Untradeable. Bounty Rookie’s Medal: REQ Lv. 30, STR/DEX/INT/LUK +3, Max HP/MP +10, ATT/M.ATT +3, Untradeable, One-of-a-kind item. Bounty Hunter’s Medal: REQ Lv. 60, STR/DEX/INT/LUK +4, Max HP/MP +50, ATT/M.ATT +4, Untradeable, One-of-a-kind item. Bounty Veteran’s Medal: REQ Lv. 90, STR/DEX/INT/LUK +5, Max HP/MP +100, ATT/M.ATT +5, Untradeable, One-of-a-kind item. Bounty Master’s Medal: REQ Lv. 135, STR/DEX/INT/LUK +6, Max HP/MP +300, ATT/M.ATT +6, Untradeable, One-of-a-kind item. Bounty Legend’s Medal: REQ Lv. 150, STR/DEX/INT/LUK +7, Max HP/MP +350, ATT/M.ATT +7, Untradeable, One-of-a-kind item. Bounty Hunter’s Badge: STR/DEX/INT/LUK +5, Max HP/MP +10, Speed +5, Jump +5, Untradeable. 30 day duration (can be extended with Hourglass items). Bounty Hunter’s Bronze Badge: STR/DEX/INT/LUK +6, Max HP/MP +30, ATT/M.ATT +1, Speed +6, Jump +6, Untradeable. 30 day duration (can be extended with Hourglass items). Bounty Hunter’s Silver Badge: STR/DEX/INT/LUK +7, Max HP/MP +50, ATT/M.ATT +1, Speed +7, Jump +7, Untradeable. 30 day duration (can be extended with Hourglass items). Bounty Hunter’s Gold Badge: STR/DEX/INT/LUK +8, Max HP/MP +400, ATT/M.ATT +2, Speed +8, Jump +8, Untradeable. 30 day duration (can be extended with Hourglass items). Bounty Hunter’s Platinum Badge: STR/DEX/INT/LUK +9, Max HP/MP +450, ATT/M.ATT +3, Speed +9, Jump +9, Untradeable. 30 day duration (can be extended with Hourglass items). Various special scrolls for Sunglasses, Earrings, Necklace, and Ring. Wear multiple items from each level (Rookie, Hunter, Veteran, Master, Legend) to receive a set effect that increases various stats, including ATT, M.ATT, W.DEF, and M.DEF. Click on the event notifier on the left side of the game window and select “[Sengoku Era] 2x EXP Buff Event”. Receive the Sengoku Jewel item. Keep the Sengoku Jewel in your inventory and stay logged in for 30 minutes. After 30 minutes, the Sengoku Jewel becomes the Empowered Sengoku Jewel. Turn in the Empowered Sengoku Jewel to receive the 2x EXP buff. This event can be repeated 4 times daily. You must stay in game for 30 minutes to receive the reward. If you get disconnected from the game, you’ll lose the Sengoku Jewel items and will need to start the quest again. 2x EXP (30 Min): Buff that lasts for 30 minutes. Click the event notifier on the left side of the game window, and accept the quest “Monster Purge”. Hunt 300 monsters within your level range. Some monsters do not apply. This event can be completed once daily per character. Jett Damage Skin: Can only be traded once per account. 8 slots chair or title bag: Cannot be traded after use. Advanced Potential Scroll, Advanced Equip Enhancement Scroll, or Chaos Scroll of Goodness 50%: Can only be moved within the account. 1-hour 2x EXP or drop coupon (3): Coupon Box lasts for 7 days after being obtained. Each Coupon lasts 24 hours after the Coupon Box has been opened. Accept the event from the event notifier on the left side of the game window. You will receive the following items upon starting the event: Isis’s Empty Bottle and Osiris Shoulders (duration-based). Stay logged into the game for 30 minutes, and Isis’s Empty Bottle will be filled and turn into a Resurrection Elixir of Isis. Turn the quest in to use the Resurrection Elixir of Isis on the Osiris Shoulders to extend its duration by 3 days. The first time this quest is completed the duration of the Shoulders will only be increased by 1 day. Once the quest has been completed a total of 14 times, the Osiris Shoulders will become a permanent Revived Osiris Shoulders. The quest can only be run once per character, per day. Osiris Shoulders – Shoulder Accessory that holds Osiris’s Spirit. Duration can be extended using Resurrection Elixir of Isis. Req. Lv. 30, STR/DEX/INT/LUK +10, Max HP/Max MP +200, ATT/MATT +6, DEF/MDEF +100. Untradeable. One of a kind item. Durational. Revived Osiris Shoulders– Shoulder accessory that holds Osiris’s Spirit. Req. Lv. 30, STR/DEX/INT/LUK +10, Max HP/Max MP +200, ATT/MATT +6, DEF/MDEF +100, Number of upgrades available: 3, Number of Hammers applied: 0. Untradeable. One of a kind item. . Permanent. Accept the Attendance Check event through the Attendance Check notifier or the Star event notifier on the left side of the game window. Hunt 200 monsters within your level range. Some monsters do not apply. Your attendance status can be checked by clicking the Attendance Check notifier on the left side of the game window. Log on during the event period and accept the ‘Scavenger Hunt Event’ quest through the quest notifier. (Only one character per account can participate in the quest/event, so choose carefully). Collect the required items by hunting monsters around your level range (within 11 levels below or 21 levels higher than your current level). Complete the quest on the event notifier. Click the achievement gift box on the achievement event UI and get your reward (EXP for your level range). Open each achievement quest in order during the event period (for example, open D-1 the day before the event end date, open D-5 five days prior to the event end date). You don’t have to participate in the event every day, but you must complete the Scavenger Hunt Event achievements in order. You can’t repeat multiple achievement quests, you can only do them in order one after another. Maple Leaf Blessing Buff: You can get buffs at different levels, Increases ATT/MATT: for 30 minutes based on how many Achievements you’ve completed. Buff duration: 30 min, Buff Cooldown: 30 min. The Maple Leaf Blessing Buff is available for 2 weeks after the Scavenger Hunt Event ends. It doesn’t disappear from your inventory when you use it; instead it continues to be available for use for two weeks after the Scavenger Hunt Event ends. Explorers and other classes each get a different buff effect (Dual Blade and Cannoneers receive a non-Explorer class buff). During the event period, you can hunt monsters within your level range to get Rainbow Boxes. The Rainbow Boxes can be opened until September 16. Open the Rainbow Box to receive a random reward. Rainbow Earring: Req. Lv. 35, DEF/MDEF +35, Accuracy +10, Avoidability +10, Number of upgrades available: 7, Number of Hammers applied: 0. Untradeable. Rare item. Has Potential. 1 AM – 5 AM and 4 PM – 8 PM Pacific on Monday, Wednesday, Friday, Saturday, and Sunday. Talk to Gold Richie in the Event Hall to begin the Owner of the Safe event. Between 12 AM and 9 PM Pacific, hunt monsters within level range to obtain Gold Richie Figures. Some monsters do not apply. Use the Gold Richie Figures to take a chance at guessing the safe combination between 3 PM and 9 PM Pacific. The next round begins 30 minutes after someone gets the correct password and opens the safe. The gift must be claimed before the event ends. Fafnir Weapon Box: Untradeable, 1 day duration. Open to receive a random Lv. 150 Fafnir weapon. Tyrant Belt Coupon: Untradeable, 1 day duration. Use to receive a Tyrant Belt for your class. Roasty, the Hot Summer Shop owner is setting up shop in the Event Hall. Spend your hard earned Hot Summer Coins on some sweet items. Golden Damage Skin: 300 Hot Summer Coins.